Three Birmingham Business Alliance (BBA) investors are finalists for the 2017 Ernst & Young Entrepreneur of the Year Awards. The BBA was proud to help nominate American Family Care, Medical Properties Trust and Shipt for the honor. Each week leading up to the announcement of a winner, we will feature one of the investor finalists. The BBA spoke first with Birmingham’s Dr. Bruce Irwin, CEO of American Family Care, about his business. Ranked as one of the fastest-growing companies in the U.S., American Family Care has spearheaded the importance of non-emergency room urgent care since its inception in 1982. It is the nation’s leading provider of urgent care, accessible primary care, and occupational medicine, with more than 170 clinics and 500 in-network physicians caring for 2 million patients a year. Dr. Bruce Irwin: Relative to starting American Family Care (AFC), it goes back to my time as an Emergency Room physician at Brookwood Medical Center. Non-emergencies were clogging up the waiting room and I knew there was a better way to get people the care they needed more efficiently. So, I sketched a plan for a network of urgent care clinics on a notepad. As an ER physician, my work schedule dictated that I work seven days straight, after which I then enjoyed seven days off. During my seven days off, I focused on the development of this new concept. Starting with $5,000 of my own money – and after meeting with dozens of lawyers, architects, city administrators, and bankers – I opened my first urgent care clinic in June of 1982. 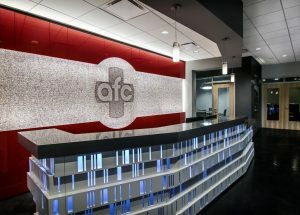 From that modest beginning, AFC now has nearly 200 medical centers in 26 states serving 2.8 million patients each year. Irwin: I have been an entrepreneur nearly all of my life. I began shining shoes when I was six years old. A few years later, I started a lawn mowing business and hired my friends as my employees! Since then I’ve owned many businesses. Some are related to AFC, while some are completely different. I didn’t simply aspire to be an entrepreneur because, for the most part, I always have been an entrepreneur one way or another. Irwin: Since opening our first medical center in 1982, we’ve created more than 1,000 Alabama-based jobs, including more than 500 that have been added since the 2008 economic crisis. The numbers speak for themselves. Birmingham has been a great place to grow a business. There is considerable talent here in Birmingham, from which we recruit. Birmingham is also home to some of our most important business partners, such as law firms, advertising agencies and construction companies. What’s more, we are incredibly proud to call Birmingham home. Click here to learn more about American Family Care and be sure to read our newsletter in the coming weeks to learn more about our other investor nominees – Medical Properties Trust and Shipt.